Getting injured as a freelancer | Justice for Couriers! Posted on 2018/10/30 by Foodora take responsibility! 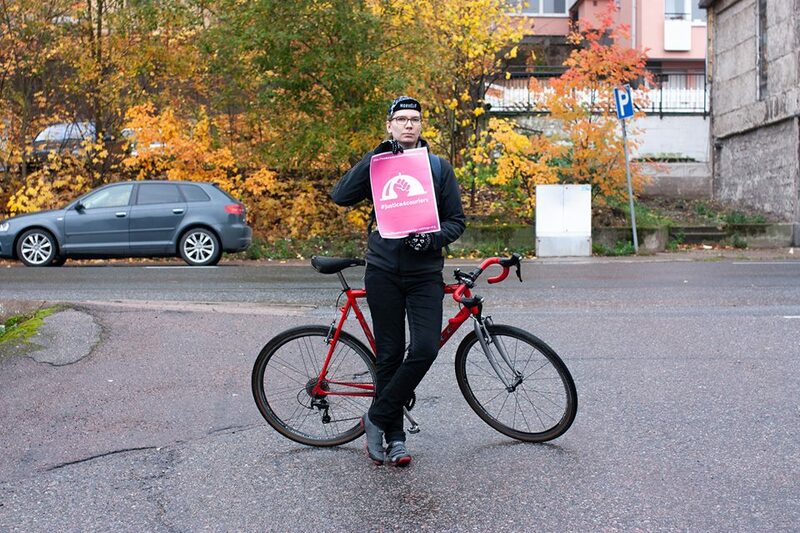 Last winter I was biking down a hill towards the city centre to pick up a new order. At the bottom of the hill is an intersection and I had the green light. As I was nearing the intersection, a car turning left didn’t notice me; I remember being startled as I suddenly noticed the side view of a car right in front of me. I remember little of what happened next, but apparently I managed to dodge the car while still braking hard enough to send me over my handlebars into the middle of the intersection. I couldn’t get up on my own, but luckily some pedestrians came to my help and called an ambulance. I was wearing reflective gear, my bike had lights and the road was well lit. Luckily I didn’t break any bones. Based on the condition of my helmet I didn’t hit my head anywhere either. What followed the accident left me feeling completely alone. I told my captain as well as the senior rider captain in Turku about what happened, but I was never asked any details by Foodora. Visiting the doctor about the weird pain in my shoulder, fixing my bike and sorting out everything with my insurance company was all my own responsibility. The physical and mental trauma meant I wasn’t able to get on my bike for several weeks, which also meant I was completely without any income during that time. There were many times an accident like this could’ve happened but luckily didn’t. Couriers working in city centres are underdogs when it comes to the flow of traffic as many car drivers are simply oblivious to the fact that bikers need their space on the road as well. Foodora’s system of ranking its couriers based on their performance creates the feeling that one always needs to be faster and more effective. Rider captains keep on emphasizing safety, but they don’t really need to even take part in the competition since their shifts are guaranteed by their employment contracts. This entry was posted in General by Foodora take responsibility!. Bookmark the permalink.